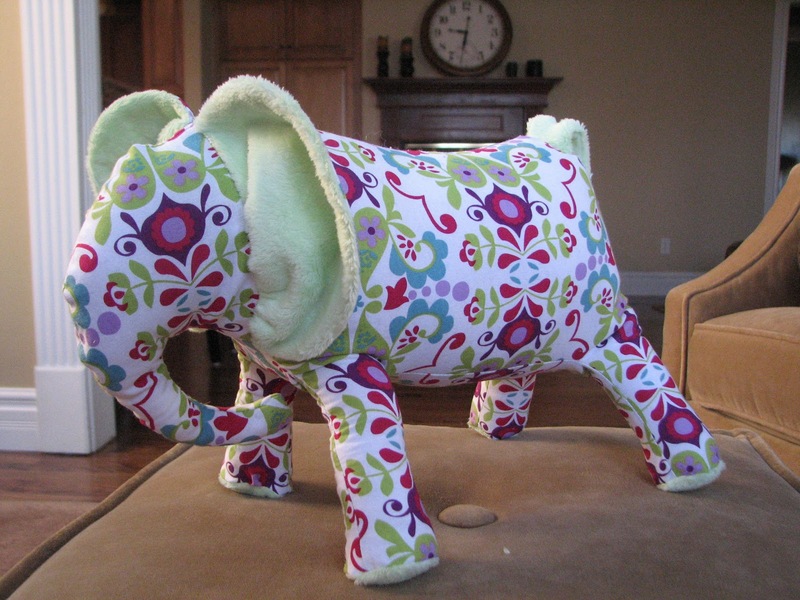 Madame Sew-and-Sew: Who doesn't love to support a children's hospital? Who doesn't love to support a children's hospital? Have you seen Wonky Wilma? I learned of her from Scruffy Badger, and instantly fell in love. Janet of Kitchen Table Sewing created the pattern and will email it to you for a donation to the Great Ormond Street Hospital charity. 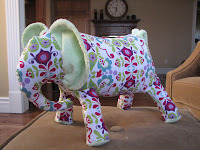 Our family is a big supporter of Arkansas Children's Hospital, and we all adore elephants, so I signed up immediately. Coincidentally, my office had a "white elephant" party on the calendar, so I thought it would be fun gift that one of the young moms in the office would grab for her little one! Wilma is only slightly wonky, in fact I think she is adorable! 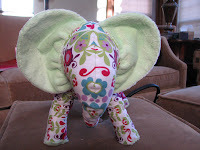 I made mine with Minky ears, tail and foot pads, and used a funky print for the body that allowed me to place an eye-shaped pattern in the eye area and avoid using buttons, making it safe for little one who may want to eat a button. My kids -- who are really too old for stuffed animals -- fell in love with her. My daughter plans to make one for her white elephant party next week, as well as another for herself. My eleven year-old son begged to keep this one. I now wish I had given it to him and just bought a gift card for the exchange. As in the past, I was sorely disappointed with the office party. Very little imagination was put into most gifts, and unfortunately, the person who opened Wilma was a young man in his 20's, who behaved as an unhappy toddler would when he saw the contents of the package. He has probably already thrown her into the trash. I feel terrible that I wasted the little treasure on someone so unappreciative of handmade gifts. I suppose I am spoiled, because anyone I've ever gifted in the past has been so happy to receive it -- or at least they were gracious enough to act as though they loved the gift. Oh well, as we say in my business, "Lesson learned." My daughter and I still plan to make a few of these for little people we know will enjoy her, and I think it is a wonderful gift that Janet has given to both the hospital and to those of us who sew. It's so sad when you put all the time and effort in it and someone doesn't appreciate it :'( Wilma is adorable and hopefully she found a nice place after all!